This loan needs no collateral. Just get in touch to apply. Sometimes, simple is better. A personal loan can help you with any unexpected expense, from emergencies to big celebrations, all with the same easy application. The many custom terms and amount options guarantee we'll find a good fit for your needs. You can get a secured loan to keep saving while you spend, or enjoy the ease of a signature loan: no collateral needed. 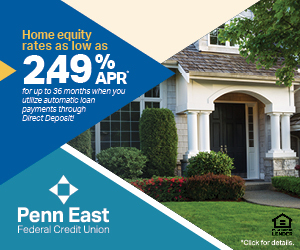 "The folks at Penn East made the process very simple and clear. The Loan Officer called me when she said she would to answer my questions and gave me options. I'm grateful for their help!" Come into one of our branches, or give us a call at (570) 342-2720 to apply. *APR=Annual Percentage Rate. The Annual Percentage Rate is the advertised rate. Rate and loan approval based on creditworthiness. Rate is subject to change without notice. Full details available at the credit union.